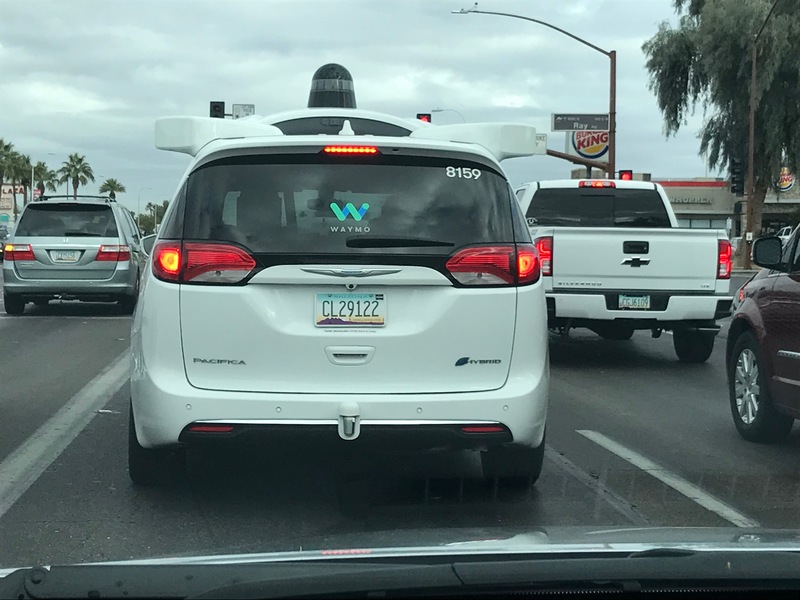 The ‘W’ on the rear window stands for Waymo, the Google/Alphabet division that is probably the leader in developing driverless technologies. Depending on which insurance thought leader you talk to, driverless vehicles will revolutionize our business or destroy it. I’m a skeptic: We will have driverless cars; everyone will use them, but not for another 20-plus years; and they will not be the death of auto insurance. Google’s not-so-secret testing facility is just south of Phoenix, in Chandler. I couldn’t find it on Google Maps (it’s a secret, surprise surprise), but I could find Chandler City Hall. In an adjoining lot sat three or four bubble-headed Waymos. They are eerily identical Chrysler Pacifica minivans. Each is white. Each has the same bubble brain on the same spot of the hood and the same aqua-and-sea-green W logo. And, though they are white, the desert sun reveals no hint of grime. I parked across the street and began my stake-out. A team of hipsters (wide beards; skinny khakis) gave each car its inspection. I watched one circle his car slowly. Its windshield wipers were flipped up, probing the air like an insect’s antenna. The man wiped at the windshield, then continued around. About 10:15 (after the morning rush, I archly noted), the first set out. I made a quick U-turn to trail it. A sober-faced bearded man occupied the driver’s seat. He is there in case the machinery needs a hand. The car set out south, made a right, drove a block, made another right and went north on a busy street. I followed. It went through a traffic light, barely getting into the intersection before the light went yellow. As the trailing vehicle, I had to decide: Should I gun it through the yellow/red? Was I in hot pursuit? I stopped. Poor Waymo wouldn’t be allowed to run a red; it wouldn’t be sporting if I did. I also thought it would be bad to cause an accident while tailing an accident-free car. I watched the Waymo, oblivious to my designs, give me the slip. It went a few hundred yards, then made another right. That’s three consecutive rights, and it took the car to a spot it could have reached by making one left. That’s the rap on Waymos: They don’t like to make left turns where there is no light to usher them through. I gather it can be a something of sport to sit behind them as they try. Anyhow, I didn’t need to experience that. I understand these cars won’t be perfect tomorrow, but will improve inexorably over time. I tried to track that first car down, but soon enough another came by. As I tailed that, I saw another. For about a half-hour I would hopscotch from one to the next, then fall in behind, ticking along at exactly the speed limit, as they do. I would pull alongside at a traffic light and glance over at the side mirror, where a fist-sized sensor – it looked like a vertical turbine, but turned inside out – whirred, sensing things in the driving environment that were a mystery to me. Or I’d zoom ahead and monitor from my rear-view mirrors as they moved forward, steadily and with purpose. The gents with beards and skinny khakis know you are tailing them, because no human proceeds down the street like these cars do. These cars always move at exactly the speed limit. They only change lanes when they must. Their turns – right or left – are exceedingly, maddeningly precise. They are six-cylinder bureaucrats. I’m not even sure you can call their movements driving. The verbs we use to describe automobile propulsion – driving, race, cruise, creep, crawl – Waymos don’t do those things. Those words convey drama. Waymos remove the drama from auto travel, and that makes them safe.